People could increase their chances of developing serious illnesses after spending just two weeks as a 'couch potato', new research suggests. Muscle mass falls as a result of 14 days of sitting around, experts say, while body fat increases and there is the potential for high cholesterol. People should strive to take 10,000 steps or more each day, according to t he team from the University of Liverpool. As part of the study, the experts from the university followed a group of 28 healthy people of a normal weight, who had an average age of 25. Those involved typically took 10,000 steps each day but did not undertake more than two hours of structured exercise a week. After wearing smart armbands for 14 days and reducing their activity levels by more than 80% to roughly 1,500 daily steps, significant changes to the body were witnessed. There were losses in muscle mass, as well as increases in total body fat. Liver fat rose, as did bad cholesterol markers. The people taking part in the research additionally saw their cardio-respiratory fitness levels fall back. Even walking is better for the body than taking no exercise at all, Dr Dan Cuthbertson, who led the work, has now suggested. The expert commented: " If you think of a typical mum at home who is always busy and on the go but doesn't go the gym regularly, there are still significant health benefits in what she's doing." Obesity and illnesses like Type 2 diabetes could face those who fail to get the required volume of exercise, Dr Cuthbertson added. He continued: "The take-home message is two-fold. If you do formal exercise, it may not be enough and keeping active as part of your daily life is important. And for those who don't exercise, avoiding prolonged sitting and increasing your daily step counts has clear health benefits." 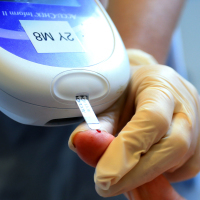 People who already have conditions such as diabetes can seek specialist insurance before heading abroad. For instance, diabetes travel insurance is available, covering things like medical expenses and lost medication.